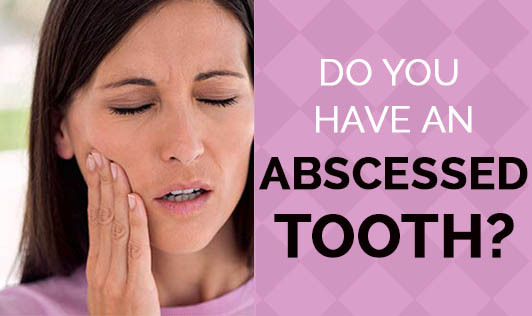 An abscessed tooth is a very painful infection at the root of a tooth or between the gum and a tooth. Commonly caused by tooth decay, this condition can also be caused by trauma to the tooth such as when it is broken and chipped or gum disease. The bacterial infection can cause swelling and inflammation at the tip of the root. • Sensitivity to anything hot or cold that is eaten or drunk. Poor dental hygiene and a diet that is high in sugar can increase your risk of a tooth abscess. Note that a tooth abscess cannot go away without treatment and if the abscess ruptures, the pain may decrease significantly but one still needs dental treatment. Sadly, if the abscess doesn't drain, the infection may spread to your jaw and to other areas of your neck and head and eventually you may develop sepsis, a life threatening infection that spreads throughout your body. If you have a compromised immune system and you leave a tooth abscess untreated, your risk of dispersal of infection increases even more. It's important for you to avoid tooth decay to prevent a tooth abscess. • Brush your teeth at least twice a day with a tooth paste that contains fluoride. • Floss your teeth or use an interdental cleaner to remove any food particles between your teeth. • Limit intake or sugary items and between-meal snacks. • Change your toothbrush every two to three months or whenever the bristles are worn out. • Use an antiseptic or a fluoride mouth rinse to add an extra layer of protection against tooth decay. If you notice any signs of tooth decay or if your tooth is chipped, seek prompt dental attention!